Luxury hotel suites. Moores Hotel St. Peter Port Guernsey. 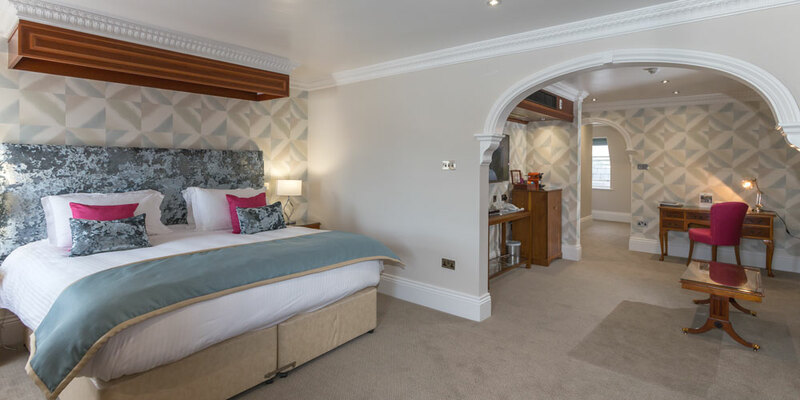 If celebrating a special occasion or planning a romantic short break holiday in Guernsey, then why not pamper yourself with a stay in one of our luxury hotel suites: The Sarnia Suite, The Bailiwick Suite or The Saumarez Suite. Best Western Moores Hotel's luxury hotel suites are very spacious, individually furnished, decorated to the highest standard and fully air conditioned. All three of the hotel's suites have king sized double beds, with luxurious bathrooms complete with separate showers, and large baths, fluffy bathrobes and slippers. For the business visitor to Guernsey seeking a central location in the main town of St. Peter Port these hotel suites provide a good sized work area. All suites provide: Smart TV, Blu-ray player, desk WiFi and complimentary soft drinks and newspapers.